The purpose of the Phase 1 environmental site assessment (ESA) is to determine, through a review of records and a site visit, whether a property is contaminated or likely to become contaminated. No soil or groundwater sampling is done during a Phase 1 ESA. The review of records pertaining to the property will provide a basis for establishing the site and area history, while the site visit will help to identify the presence of activities or facilities on the site and in the surrounding area that may potentially affect the quality of the ground and groundwaters. All Phase 1 ESAs conducted by our firm are CSA Z768-01 compliant and supervised by a Certified Environmental Site Assessor (EESAtm) of the Association québécoise de vérification environnementale (Quebec association of environmental auditing, or AQVE). Phase 1 ESAs are also certifiable under Division IV. of the Environmental Quality Act. At the end of the mandate, you will be provided with a technical report containing gathered data as well as findings and recommendations. Gather available information on the property being assessed and on surrounding lands, which will provide a basis for the history of said property and the surrounding areas. Assess, using this information, whether activities were conducted or facilities existed on the premises and the surrounding area that would represent a risk of contamination to the surveyed property. Identify, where appropriate, areas likely to be contaminated as well as potential sources of contamination. 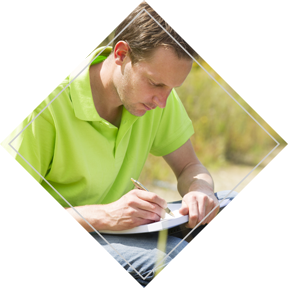 Why conduct a Phase 1 Environmental Site Assessment? Phase 1 ESAs provide an opportunity to study environmental liabilities of a property and identify both potential and actual sources of contamination as well as its environmental risks. Phase 1 ESA: a key tool for any capital transaction. In the majority of cases, a Phase 1 ESA is requested by the financial institution or private body funding the acquisition of a site. Indeed, financial institutions play an important role in this business area since their implementation, over the past few years, of processes that require the conduct of Phase 1 ESAs and characterization activities before loans can be granted for the purchase or reuse of sites that may be contaminated. Such a system secures to some degree the value of loans granted. Purchasing or selling a property with total peace of mind! Oftentimes, a property will show no visible sign contamination, and only a thorough study carried out by an expert will identify potential signs of contamination. Confirmation of contamination on a property may result in significant environmental, financial and legal impacts. That is why the Phase 1 ESA provides you with a complete assessment of the environmental status of a property and the peace of mind that comes with it. Completion of a Phase 1 ESA led by a Certified Environmental Site Assessor (CESA) is a cost-effective investment that is beneficial to all, at all times. Do not hesitate to contact us for any questions regarding the benefits of proceeding with a Phase 1 ESA. Our dedicated team will be pleased to guide you along your project and provide you with services tailored to your needs. What does a Phase 1 Environmental Site Assessment entail? Phase 1 content is based on the requirements of CSA Z768-01 and includes both a historical research and a site inspection. No soil or groundwater sampling is done during a Phase 1 ESA. Historical research consists of data collection regarding activities that took place on site or on the surrounding properties, which may have resulted in a current contamination of soil or groundwater. All the information compiled from the study of the record and the site visit will be analyzed and evaluated in order to provide recommendations and findings specific to the site being assessed. All of the information from the Phase 1 ESA is reported. What is the time frame for a Phase 1 ESA? The Phase 1 ESA time frame is usually between two and three weeks. It should be noted that the time frame for the completion of the study depends on the time necessary to obtain documents from the municipality and the MDDELCC as part of the access to information request (a process required under CSA Z768-01). The project lead assigned to your Phase 1 ESA will constantly follow-up on the record status so that you may stay informed about its progress, collated information and the proposed report presentation date. The CSA Z768-01 standard sets out the guidelines and practices that define the conduct of a Phase 1 Environmental Site Assessment. It thus states the elements that are to be part of a Phase 1 ESA in order to meet set requirements. This standard serves as a prerequisite to CSA Z769. All Phase 1 ESAs carried out by Environment PH inc. comply with the Z768-01 standard. What are the possible outcomes of a Phase 1 ESA? At the end of the Phase 1 Environmental Site Assessment, two outcomes are possible. The first is that none of the information gathered during historical research and inspection indicates a risk of contamination of the property; no further investigation is then recommended. The second is that the results of the research indicate that there is a potential and/or actual risk of contamination of the soil and/or groundwaters on the property. A Phase 2 environmental characterization is then recommended for those areas of the property where environmental risks have been identified.